I am originally from New Zealand. 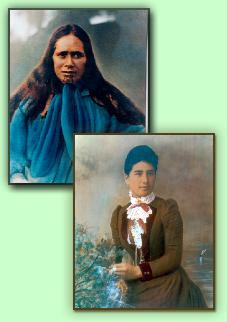 My great, great grandmother was a Maori princess and her name was Erena Pareraukawa (see photo on the left). The Maoris arrived in New Zealand about 1,000 years ago, and the canoes that brought them across the Pacific each had a name. Erena's ancestors came in a canoe called the Tainui. Since then all descendants of the canoe are recognized as belonging to the Tainui tribe. By tribal law Erena could not marry anyone outside of Maori royalty but after she met a handsome young French immigrant by the name of Louis DiHars, she was so swept off her feet by his charm that she broke all the rules and married him anyway. My great, great grandfather (Erena's husband, Louis), was born around 1820 in Libourne, France. After his brother was killed in the French Foreign Legion, Louis’s parents, fearing for the safety of their last remaining son, sent him as far away from France as possible. Louis led an exciting life in the growing colony of New Zealand. He lived among the Maori people and became fluent in their language. In time the Government hired him as an official interpreter between the Maori and the English, especially in the negotiation of land deals. In 1992 the descendants of Louis and Erena's eight children organized a family reunion and rented an entire town to accommodate the 4,600 family members who had registered for the four-day gathering. It was very moving to be in attendance with so many other relatives and hear the Maori elders chant and wail their traditional sacred Maori welcome. As a child I read books written by the beloved English children's author, Enid Blyton. My favorite stories were from two of her series called, The Famous Five, and The Secret Seven. I also loved listening to a radio show called Tusitala – a Samoan word meaning "Teller of Tales". They were stories written by Robert Louis Stevenson, the Scottish author who wrote "Treasure Island". In the latter part of his life Stevenson lived on the Polynesian Island of Samoa. After he died there in 1894, the people honored the famous storyteller by burying him in a revered location atop a mountain called, Mt. Vaea.